Model: PMH200KIT The PMH200 PA kit comes complete with a 4 channel 2x 100W mixer amplifier, pair of matching 10" passive speakers with leads, and a dynamic microphone with lead. Model: PMH200KIT The PMH200 PA kit comes complete with a 4 channel 2x 100W mixer amplifier, pair of matching 10" passive speakers with leads, and a dynamic microphone with lead. 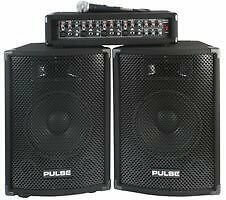 The PMH200 PA kit is quick & easy to setup making it ideal for rehearsal rooms, small to medium band gigs, small school halls or presentations.